As sweet as cinnamon: Flower Power Weekend! A gorgeous pincushion, needle case and wrist pincushion. Kris from Sew Prim Kris designed it. see my right hand side bar for the distributers. Pop over to Kris's blog for lots of inspiration. an online stitch- in going on between themselves. to achieve and spur them on. Khris is a real sweetheart! I will have to wait to find Homespun issue, but locate it I will! That's so cute! I'm working on the never-ending blocks for my quilt - I really don't like making the same block over and over! Have a great weekend Dawn! 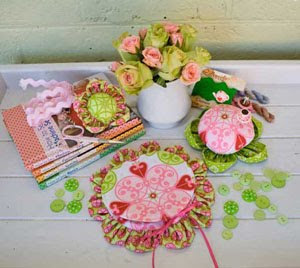 These pincushions and needlecase look absolutely gorgeous.I'll be popping over to Kris's blog. I'm addicted to stitching little garden designs at the moment. just bought my Homespun and am drooling over those pincushions....Kris has created a lovely design...can't wait to see how yours turn out and what fabric you use!!! I wonder who's doing the online stitch-in??? LOL Wouldn't it be fun to get a record number of stitch-in bloggers in a weekend doing the same thing???? Big warm sugary hugs Dawn.